It’s the unassuming nature of Jean-Luc Dufour and Ben Roiri that makes this tale even more compelling. 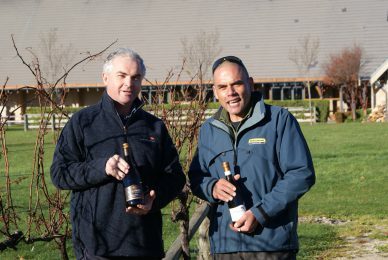 Next year marks a combined 45 years as ‘keepers of the vines’ for the pair as Vineyard Manager (Jean-Luc, with 25 years) and Assistant Vineyard Manager (Ben, 20 years) at Waipara Hills on New Zealand’s South Island. With a twinkle in his eye and pure sincerity on his face, Ben claims that the reason he turns up every day is because of ‘that guy right there,’ pointing to Jean-Luc. “Jean-Luc has put half his life into these vines…. he will not go home until the job is done – no matter what. He is a true machine,” smiled Ben. And they sure do make a great team, tending the vines that produce fruit for Waipara Hills wines. Jean-Luc grew up in Switzerland; his family has been in wine across France and Switzerland for 13 generations. After Europe, he set up vineyards in New Mexico before finally settling down in New Zealand with his Kiwi wife Sarah. There is one lesson from his grandfather that still rings true to him. “He said, ‘A good wind is better than a spray,’ and it really is,” reminisced Jean-Luc, before joking, “powdery mildew aside!” Indeed, the iconic Nor’ West wind of North Canterbury is a gift from Mother Nature that Jean-Luc has learned to use to his advantage. It’s this statement that is most telling of the calibre of these gentlemen. 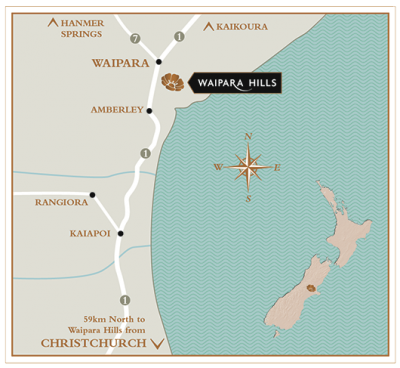 So we quietly toast you Jean-Luc and Ben, the humble yet vital pillars of the vineyards at Waipara Hills. Much respect – it couldn’t be done without you.